This is a great concept and I love it from the perspective that we are a small independent art gallery; representing some 30+ artists who try to publicize and my own artwork which I am also trying to bring to the world on a greater scale. I love the idea of something that has the potential to walk hand-in-hand with our ongoing efforts at having this blog in the cryptosphere; I also live the idea of being able to introduce some of our artists to a whole way of bringing their work to a potential world audience! What I also really like about what you're doing is that you have an actual "for profit" business plan here, not just a handful of "magical beans" that might or might not become "something." I think if the crypto world is to be taken seriously on a large scale, we need to have actual economically functional business models. I think you've described an ideal dStors merchant! Thanks! I'm going to keep an eye on what you guys develop here. Whereas I have used eBay with moderate success for many years, part of my issue with them isn't so much that there's a final value fee, but that you're out a bunch of listing fees, even if your items don't sell. Whereas I recognize that may be part of a for-profit model, it discourages many from participating. In fact, I'd happily pay a higher FVF in exchange for not having a listing fee. Of course, the idea of being rewarded for initiating commerce... rather than having to pay for it... is very appealing. Interesting and thanks for your feedback. I believe listing fees kick in after a certain threshold of free listing or a certain number of images, etc. eBay makes $500 Mil gross profit per month....there are hundreds of thousands, no, millions and millions of users who would find dStors incentivization appealing. Hoping for good times ahead. Best wishes.. Fan of the project and already delegating 500SP but that 2020 doesn't really add to the seriousness here IMO :D it looks like some kids just playing around and throwing out numbers and graphs :D I know that you pointed out to not take it so too seriously and it's just a bold vision but I mean.. noone knows which of the platforms will "win the race". It's hard to say where STEEM will be in two years and here you're "estimating" all the other big players using "wizard ball" style :D post would be better without it IMO :) maybe at least different type of graph/table would be better...I feel it's just way too specific without actual need for it. Want to earn STEEM for getting better in your own craft every week! Join Learn & Earn league! Understood. But if we're going to aim high, let's aim highest. That was the message the post was trying to convey. Very good question. Every completed transaction pays a 7.5% final price fee. So, that should represent a barrier to abuse. Once and IF the price of STORS exceeds the 7.5% fee; then the auction based use of STORS token for upvote bidding should also further deter abuse. great info and graphics, very cool, i'm along for the ride as a 500 SP delegator. Proof of brain needs to evolve into proof of business! "Our revenue model is derived from seller paid fees calculated from final sales price and product listings transacted on dStors.com. We readily accept STEEM and SBD as well as Visa and Paypal." Why not also accept your own token? Or am I missing something? Good question and yes, that option is open and available. We first want to open the biggest channel possible for easiest STEEM/SBD spend. We will also attract merchants and sellers from outside of Steem community and thus the reason for accepting VISA/Paypal. However, STORS token spend for upvotes will at first require a Steemit account to be setup so ideally, new user signups should increase. It is awesome that you accept VISA/PAYPAL! @dstors I am so Grateful to be one of the EARLY Delegators and I look Forward to the HUGE SUCCESS that I feel is Ahead for what @dstors is going to do.........I am very confident that people will look back at this time and say "Why did I not Delegate Then ?" Thank you! Great video overview. The Whales have been very silent. Its sounds like a very promising venture and you have captured my interest. One question I like to know, is Dstor Technologies dstore.org the same? Whoever wrote this post is an amazing author @dstors it's direct, concise and easy to understand. P.S I'm glad you pointed it out! I love how quick Steem is! What makes it so quick? Like i told you before, you are a known scammer to me. Please do not comment on any of our dStors posts anymore. A merchant-buyer matching platform on the Steem Blockchain? this is interesting. Good luck with your Delegation Round and all the best! It certainly can't hurt to expand the use cases for this blockchain, and see what shakes out. The more, the merrier at this point. How did you manage to forget about Ethereum? ETH has one of the slower transaction times and scale compared to the listed blockchains. It wouldn't be able to even compete with STEEM's 3 sec. cycle. So I have delegated 100 SP the very next day @dstors came up with the delegation process but in this article it is written that 500 SP is the minimum amount to be delegated so will I be receiving any Tokens?? I'm sorry, STORS token will be distributed to minimum of 500 SP delegations. I will update my delegation ASAP. By the way is there any way to check the Tokens I own. Tokens for delegators will start being sent on month 4 of the 6 months. 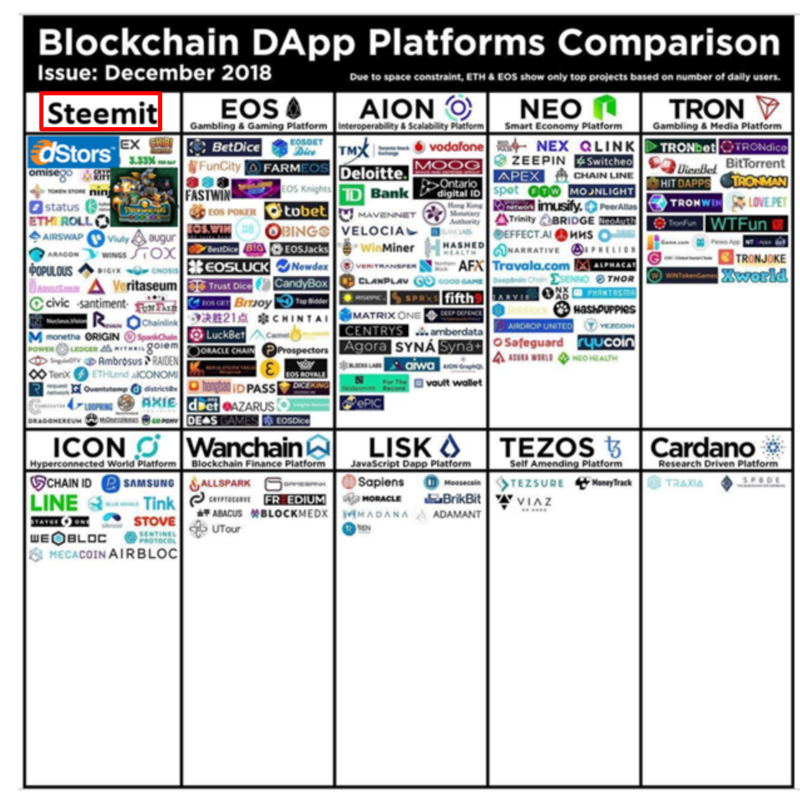 The most talkative dapps on steem Blockchain currently. @dstors I know I am pretty late but would love to know the delegation benefits that a delegator would receive. Also in case my delegation would benefit me now ? How many for-profit companies currently run on the Steem Blockchain? Every companies are "for-profit", except non-profit organizations. It is quite common to begin with non-profit at the beginning for a bigger pie once they become a large scale (e.g. Facebook, Youtube, etc). "for-profit" doesn't mean "profit from day 1"
Yes. End shows the credit link and modified notice. How many for-profit companies currently run on the Steem Blockchain? Prospectively, two: @dStors and @SteemMonsters. Is this good? Unacceptable! There are many projects in Steem that are heading to have its revenue stream, and some of them already has like @steemmonsters you mentioned. However, it doesn't mean that other projects has NO profit seeking. It's just a different BM. Especially the social dapps like @steemhunt, @actifit, @tasteem, @trips.teem, ... need to gather the user traffic first to embed ad-based BM. It doesn't mean that they never have a chance to make a profit. Wow, that 500 min is pretty steep. I appreciate you are trying to build something awesome, but that is just more than I can afford to delegate right now. I am kind of bummed. Good luck though, I hope you guys reach your goal. You got a 11.21% upvote from @booster courtesy of @dstors!